Five days after the Brexit result was announced, and less than two months after the Holyrood vote, we have a full Scottish Parliament poll, conducted by Survation for the Daily Mail. I appreciate only true anoraks will care, given the next Scottish general election is 59 months away and given complete political turmoil, but nevertheless it’s interesting to see a quick snapshot of how the Holyrood parties are being scored. It’ll be superseded soon, but it tells a fairly simple story: two up, two down. The SNP would be markedly up, back to their 2011 peak of 69 seats and regaining their overall majority. The Tories would see the sharpest decline, although they’d still be well above their 2011 figure. Labour would see the worst result ever – something which has been true in every Holyrood election after 1999. That would put them just 4.3% ahead of the Greens on the lists, and only eight seats ahead of Patrick Harvie’s delegation, which would almost double in size. And despite all that change, absolutely no change on May for the Lib Dems in seat terms – despite a boost to their regional vote. Looked at a slightly different way, the pro-independence parties would gain 11 seats from Labour and the Tories, with no change for the federalists, although Labour and the Lib Dems’ positions on the constitution would definitely be in question if they do in the end have to choose between the UK and the EU. Has the increase in support for independence given Brexit driven this? It seems likely. The seat projections are from Scotland Votes. The Cutbot one doesn’t yet have the 2021 data in, so until it does I’m reverting to that. Thanks to Alan for providing the full tables for this post, too. They didn’t get used in the Mail (too busy reporting the downsides of Brexit?) so I think this is exclusive. The latest monthly Record/Survation poll (formerly in partnership with this blog) is out, and it’s a corker. As per previous polling posts here, the vote share is the change on last month, and the seat change is since 2011. And as usual, the ‘kippers would win some seats, but the Scotland Votes model doesn’t include them. I’ll run this again with a better predictor when I can fish it out. There’s two substantial changes here, and two only. First – Labour would see their worst ever Holyrood result by some margin, reduced to barely a fifth of the Parliament. Second – this is the best poll I’ve ever seen for the Greens. We’d be up from 2 to a massive 15 seats, and would be narrowly the third largest party. Bear in mind the UKIP caveat, which would probably hit Labour hardest but would also chip one or two off the Greens and Tories. The Daily Record‘s latest poll with Survation has Holyrood numbers which, shall we say, may add to the anxiety in Labour that they still haven’t hit bottom yet. Presumably a new leader will hope for a bounce (although so too might Nicola once she’s formally in the big chair), and Labour will pass this off as a long way away and irrelevant. But it’s only 18 months away now, and the end of the referendum campaign has hardly brought them any relief. Change in vote share shown here is pretty notional – the last one of these I had was in July, and a lot has happened since then. For the sake of having some comparison, I’m using it anyway, and seats (as usual, using Scotland Votes, with its UKIP shortcoming) show the notional change on the 2011 result. Bear in mind the ‘kippers would probably secure seven here – all from the list, and therefore most likely to be predominantly at Labour’s expense, maybe two or three seats from the three smaller parties. The Scotland Votes map shows a complete constituency wipeout for Labour – with, in what would be an extraordinary humiliation, Jim Murphy’s neck of the woods turning back to Tory blue. The Tories would also pick up Dumfriesshire from Labour, but lose Galloway and West Dumfries, as well as Ayr, to the SNP. The Lib Dems would hold the two Northern Isles seats only, plus one more on the list. And the bulk of Labour’s net loss would go to the Greens, who’d be in double figures overall for the first time. And the main event, of course, would be a slightly increased overall majority for the SNP under Nicola. Hitting 50% in the first vote trumps even the 45.8% the SNP score in the Westminster poll done by Survation at the same time. 2011 was billed as a landslide, but landslides (to break the metaphor) normally recede. At Holyrood, it looks like the land is still sliding in the same direction. It would be an extraordinary achievement to say the least. For comparison, here’s what the constituency map looked like in 1999. Another thing to note about this is would see another substantial round of churn in terms of the experience of MSPs in the Chamber. Labour would lose all 15 constituency MSPs, including some of the most experienced of those who survived the 2011 landslide, and gain five more newcomers, unless they take a more relaxed attitude to MSPs standing for both. The SNP would, conversely, lose a slew of list MSPs (it’s unclear where, from the model, the two list Members they would retain would be, but the North East plus one would seem a safe bet) and gain yet more constituency MSPs. If I were Humza Yousaf or any other SNP list MSP I’d be seeking a constituency to stand in with some urgency. Similarly, the Tories would lose two of their most experienced MSPs in John Scott and former Presiding Officer Alex Fergusson, even while inching up somewhat overall. And the Greens would have a group that (unless any former MSPs are selected sufficiently prominently), which could be 80% newcomers. A lot of change for no difference in the unbalance of power, in short. 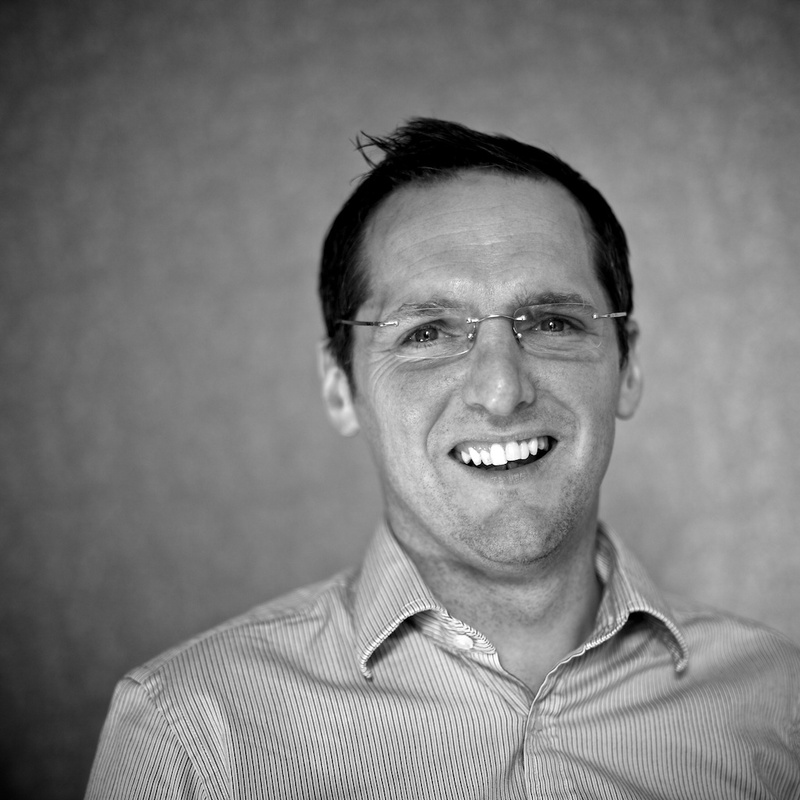 A guest today from Mark Diffley, Director of Ipsos Mori Scotland. Thanks Mark! In the fevered political climate six months before a general election, the ability of party leaders to appeal to voters has never been so important. With months of campaigning and intense public scrutiny ahead, politicians understand the need for a successful messenger as well as an appealing message. Speculation about those running for the highest office is unavoidable at the moment, from defecting Conservative MPs and their effect on the Prime Minister’s authority, to the daily travails of Ed Miliband and whether Labour will try and replace him before May. In post-referendum Scotland however, things are a little different. The unprecedented engagement of the public during the constitutional debate, culminating in the record-breaking turnout of 85%, served to increase the profile of all our political leaders and, for some, significantly improve their standing with voters. Looking at our most recent trends on satisfaction with party leaders, three interesting observations stand out. First, public recognition of Scottish party leaders has increased. We know this because the proportion of voters who answer ‘Don’t Know’ when asked about each leader has fallen during the period of intense debate over independence. This is most evident for the leaders of the smaller parties; for example, those unable to rate the performance of Ruth Davidson fell from 38% in September 2013 to 23% in October 2014. Over the same period, the corresponding figure for Willie Rennie fell from 50% to 38% and for Patrick Harvie from 58% to 38%. This doesn’t always mean that their satisfaction ratings improve but does mean that voters are more aware of them, a clear consequence of intense media coverage during the referendum debate. Second, we are clearly happier with those heading up Scottish parties than with the leaders of the equivalent parties at a UK level. So, while 35% of Scots are satisfied with the job being done by Davidson, just 24% are positive about David Cameron. 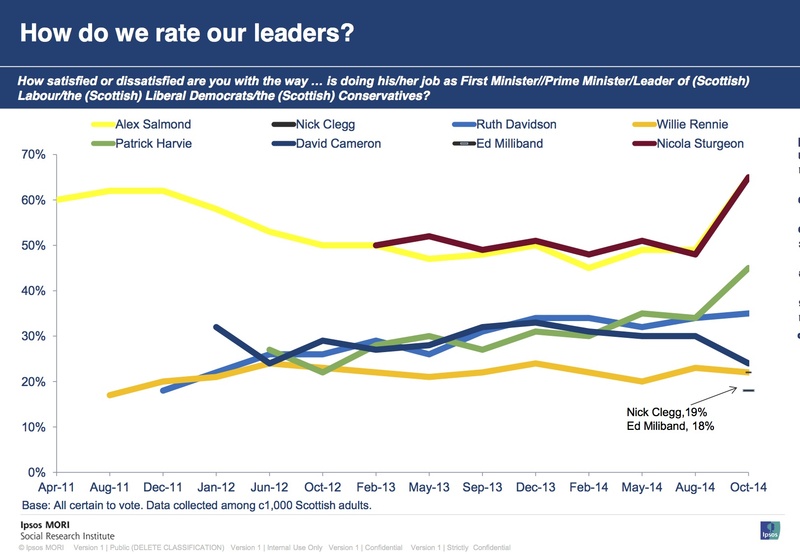 Similarly, Rennie outperforms Nick Clegg, though by a much smaller margin (22% versus 19%) and, while we did not collect views of Johann Lamont since she had resigned, a look at her trend rating (around 40% satisfied) suggests that she would have scored significantly higher than Ed Miliband at 18%. Third, despite the referendum result, leaders of parties which campaigned in favour of a ‘Yes’ vote in September have enjoyed the most significant boost in voter ratings. Most notably Nicola Sturgeon will take over as First Minister with an approval score of 65% among Scots, a rating not seen for any party leader in the UK since the early days of Tony Blair’s government when the new Prime Minister peaked at a satisfaction score of 75%. Harvie has enjoyed a similar, if less pronounced, rise in popularity, with satisfaction increasing from 27% in September to 45% now. Of course such public popularity rarely lasts, and in the carefully-managed media glare of the next few months public attitudes to leaders are likely to fluctuate, just as support for the parties will ebb and flow. But, taken with our latest polling showing a significant lead for the SNP ahead of May’s general election, these leader ratings reinforce the current public mood – there may have been a ‘No’ vote in the referendum but it is the parties and leaders who supported independence who look most likely to benefit in the next national electoral test. All this makes the challenge for Scottish Labour clear as it goes about choosing its next leader. Media coverage can help get your image and messages recognised, but the greatest priority for the new leader is to focus solely on Scottish issues and to ensure that their stance on the new devolution settlement is in tune with voter sentiment. It’s a phrase I believe Nicola coined last year, and I admit I was sceptical about it. There’s rarely a natural majority for anything, even a binary choice like independence. But I’ve come to agree with her, and now I have polling that demonstrates what she means. Using my regular pollsters Survation, I asked a series of nine trust questions. These are the results with the Don’t Knows excluded (full tables here). Who do you trust more on each of these issues? So, on eight out of nine “values” issues, voters in Scotland trust Holyrood more. Only on one (which I admit baffled me – *cough* *Iraq*) was Westminster narrowly preferred. On the first five, indicated with an asterisk, there’s an absolute majority for Holyrood even when you include the Don’t Knows. And that’s on what this question is really about: where should decisions be made? As now, split between Holyrood and Westminster, or entirely at Holyrood? It’s no wonder, either. The last decade plus of Westminster’s decision-making could have been designed as a campaign to make the entire institution as unpopular as possible. A system of bank deregulation in favour of the City led to an extraordinary crash. The aftermath of that crash was used not to fix banking and tackle inequality, but to build a three-party consensus for a war on the poor and disabled, the demonisation of immigrants, yet more tax cuts for the highest earners, and a continuation of the ideological privatisation agenda. How could an ever harsher Union not have been designed to alienate Scottish voters? Maybe the extraordinary scare campaign against radical change, coordinated from within 10 Downing Street with their FTSE 100 allies, will win. Maybe our superior ground campaign will win. But sooner or later we will be independent. There’s a natural majority for it. You are currently browsing the archives for the Polling category.